That weekend in June 1967 Sandra and I were with Ken Pearce, Ann, and their son Edward who Sandra reminds me had chicken pox. We were all camping on the Llyn Peninsula in Wales testing the mixture diving gear for the Berger expedition. We remember the heavy rain on the Saturday passing near Chester as the road was flooded. We heard of the Mossdale flood and had concern for some caving friends on our return from Wales on the Sunday evening, but still exhausted from Wales decided to wait until Monday morning to see if the situation had resolved. Gerry Beard was off work with a badly damaged hand and as the news was no better we decided to go up to Mossdale on my Vespa Scooter. We left the bike in Conistone and jogged up to Mossdale, you will remember we were all very fit in those days. Bob Leakey was at the entrance and very distressed about the situation. He asked us to call out the guys, so we reversed course, drove back on the scooter and contacted Ken Pearce, also my brother David who called out his own expedition Team. Gerry Beard and I loaded his Landrover and headed back to Conistone where we met with Jed Scott and many others,and at the cave we helped with the setting up of the control centre marquee. I remember we had more than one trip into the entrance series so that we could familiarise ourselves with the layout of the cave. The weather improved on Tuesday and after a meeting with the coroner and a senior police officer, a new search party was set up. This consisted of Dave Brook, Alan Brook, Dave Cobley, John Rushton, John Sinclair and John Trott. We were requested to not only look for the sixth missing person (John Ogden) but also to bring back proof the other five cavers were within the cave, and we were to bring out transportable personal possessions from the missing cavers for Identification. A large Support Party spread from the cave entrance to various points within the cave. Ken Pearce and Jed Scott remained at Rough Chamber as support, and the final group of six split into two Teams with Dave Brook, Dave Cobley and John Sinclair on one team and Alan Brook, John Rushton and John Trott on the other team. One team negotiated Far Marathon East and the other team went down Leakey’s Marathon (Far Marathon West) both teams uniting at the junction just before the chimney into the High-Level Mud Caverns. The five missing cavers were located here and personal possessions were collected to remove from Mossdale for the coroner. John Ogden was not located although the two teams also searched extensively as far as Mud Caverns South, but to no avail. The search party then left the cave with the collected personal possessions for the coroner. We then attended a debriefing meeting with the coroner and the senior police officer. At the meeting, the coroner decided that the missing cavers’ bodies were to remain in Mossdale which would be sealed after further searches for John Ogden which would be planned for another day. We packed what we could then drove back to the Manchester area, feeling so very sad and devastated over the tragic loss of our friends. On Saturday 24th June 1967 I had just collected a second hand car and I had made a decision to go caving on the next day and take a run out in my new car. On Saturday night I was caught out in the torrential thunder storm that passed through Yorkshire and thought that the chances of a caving trip on the Sunday would not be good. I drove up to the top of Wharfedale to Langstrothdale with some caving friends but quickly realised that going underground in the flood conditions that prevailed would be out of the question, instead we had a walk onto Horse Head Moor. As I drove back through upper Wharfedale in the late afternoon passing Kilnsey Crag, I saw a number of Fire Engines parked on the bridge over the Wharfe at Conistone. The idea that the presence of Fire Engines might somehow be connected to my friends, whom I knew had planned a trip down Mossdale for that day, never entered my mind. I thought that the high water conditions may have flooded somebody’s home and the Fire Brigade were there to pump them out. When I arrived home and was having my tea I saw on the news that there was an incident at Mossdale with a number of fatalities. My heart was in my mouth as I went to the public phone at the bottom of the road where I lived and rang Roger Sutcliffe, who at that time was the contact for the Bradford section team of C.R.O. of which I was the underground leader. Roger confirmed that the ongoing rescue attempt was for Bill Frakes, John Ogden and my other friends and that the police had been trying to get the team together since early morning. Roger told me that I needed to go to the police station on Bolling Road in Bradford very early next morning, Monday 26th June to where the Bradford Team would assemble and be taken up to Mossdale. When the team arrived in Conistone we were transferred to a Landrover and taken up to the cave. I have a clear memory of meeting Jack Pickup, who was a good friend and fellow member of the Happy Wanderer’s coming down the track toward me in another Landrover. Jack was very despondent and told me that all the lads were dead with the exception of John Ogden and that it did not look very good for him. I continued up to the cave with the members of the Bradford team. Arriving at the cave the scene resembled what I imagined a Klondike gold field to look like during the gold rush time. There were tents everywhere and heavy machines working; two rows of Coventry Climax pumps working continuously pumping water from the dam. People were in the river shoring up the dam and filling sandbags. Large diameter hose pipes were snaking across the area in front of the cave and discharging huge jets of water away from the entrance. I quickly made my way across to Brian Boardman whom I knew well, he informed me that I was on stand-by along with some other members of the Wanderer’s whom had already been underground and were now resting between shifts. Later I joined with other members of the Wanderer’s working on the dams and filling sandbags. Occasionally we would be called over to the cave entrance to be informed of the outcome of the latest team to go in and search for John Ogden. We were fed by a team from the W.V.S. and the first night I slept in a large tent that had been erected for that purpose. During Tuesday we had some disturbing news; a crutch strap from John Ogden’s wet suit had been found close to the other bodies. The wet suit belonged to Dorothy Clegg and she confirmed that john had been wearing it. Dorothy was inconsolable. Late on Tuesday evening a group of us including me, Kenny Taylor, Bob Gillibrand and Randy Coe were told to get kitted up and prepare to go underground in the event that John Ogden’s body was not found by the latest party to search for him; a team led by Brian Boardman. We were to be the very last team to be sent into the cave. 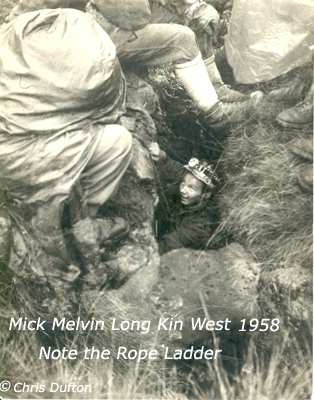 We were still on stand-by when in the early hours of Wednesday 28th June Brian Boardman came on the telephone from Rough Chamber to say that he had found John’s body where he had forced himself upwards into a tight rift, he was very close to the other cavers who had perished with him. When Brian and his party returned to the surface Ken Pearce came to speak with us and told us that no one would be allowed back into the cave to evacuate the bodies. The coroner, Mr Stephen Brown and the police had made this decision. Many people were furious at this suggestion as we had expected to be allowed to recover our friends and bring their bodies out and return them to their loved ones. No amount of arguing would change the coroner’s mind and he was determined to seal the cave for good. Later that day wheelbarrow loads of earth and rocks were tipped into the cave entrance and soil thrown over the top. Several members of the Happy Wanderers and University of Leeds Speleological Association were still fuming over the coroner’s decision when we left for our homes later that day.